Hades was the god of the underworld and the name eventually came to also describe the home of the dead as well. He was the oldest male child of Cronus and Rhea. Hades and his brothers Zeus and Poseidon defeated their father and the Titans to end their reign, claiming rulership over the cosmos. They agreed to split their rule with Zeus becoming god of the skies, Poseidon god of the sea and Hades god of the underworld. He was later known to the Greeks as Plouton, which the Romans pluralized to Pluto. The god of the underworld was married to Persephone, the daughter of Demeter, whom he obtained through deception after abducting her to the underworld and giving her the forbidden fruit pomegranate, forcing her to remain in the underworld with him for one third of each year. Hades is best known as the ruler of the underworld. It became his dominion after he and his brothers drew lots for their share of the universe. According to Iliad, Hades’ dominion lies between secret places of the earth. According to the Odyssey, one must cross Ocean to get there. Though Hades supervised the dead assigned to his realm, he was not one of its judges. Three demi-gods served that purpose instead. Hades was depicted as stern and unyielding, unmoved by prayer and sacrifice. Hades had a cap or helmet that made its wearer invisible. His wife was Persephone, Demeter’s only daughter, whom he kidnapped and made his queen. He was also called the God of Wealth or “the rich one” because he possessed the precious metals of the earth. Pirithoüs, friend of Theseus, detrmined to have Persephone (the most carefully guarded lady in all the universe) as his bride. To this end, the two friends journeyed to the underworld, but Hades thwarted their plan. He invited them to sit on the Chair of Forgetfulness, which cause its occupant to forget everything. Hercules rescued Theseus, but the King of the Dead held Pirithoüs there for trying to steal his queen. Cerberus was a three-headed dog who guarded his realm; the ferryman Charon was another one of the underworld’s attendees. Though Hades is the King of the Dead, he should not be confused with Death itself, which is personified by Thanatos. 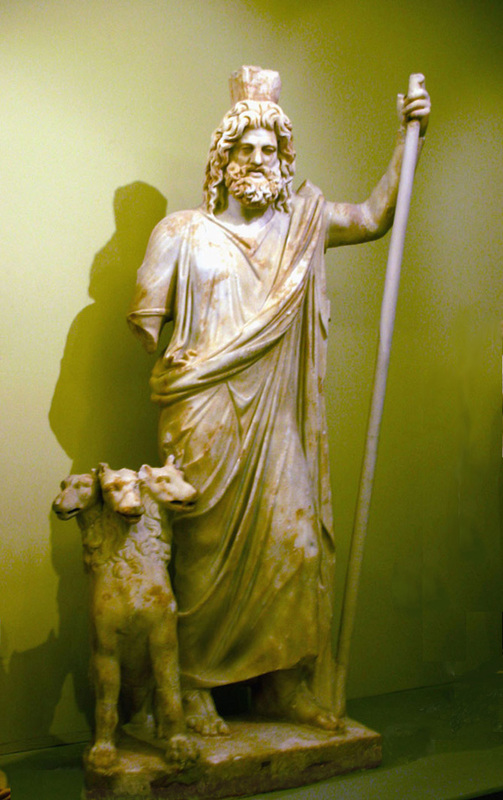 Cronus and Rhea were his parents. Poseidon and Zeus were his brothers. Hades rarely left the underworld. His presence was not welcomed by men or by gods. Hades took pride in collecting “subjects” for his kingdom and was disinclined to let anyone leave. His dominion was separated from the land of the living by the following rivers: Styx, Lethe, Acheron, Phlegethon, and Cocytus. Hades employed the Furies, who were responsible for torturing the guilty. Hades is described by some sources as the god of the earth’s fertility. The narcissus and the cypress are sacred to him. In his kingdom, Hades sat on a throne made of ebony and carried a scepter. Hades was known for his involvement with Sisyphus, the man condemned to the underworld to forever roll a boulder uphill. According to legend, Hades allowed Sisyphus to return to earth long enough to arrange his own funeral.